When you like your dress outfits, walking suits and casual sets to have some flavor, why not give Montique a Try. These matching casual outfits are perfect party clothes for the style invested man. 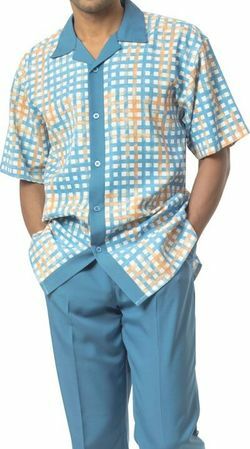 This blue stripe style plaid short sleeve walking suit features an unique style collar and solid color pleated pants. Made of a soft poly fabric.